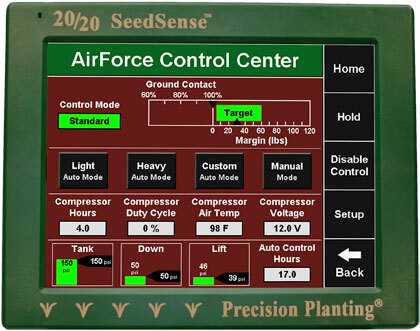 The 20/20 SeedSense® system teams with 20/20 AirForce to automatically measure and manage down force to make sure you run as light as possible, while maintaining the ground contact that assures uniform seeding depth. SeedSense includes smart pins that measure the weight on the row unit and calculates the amount of excess weight that could be removed while still maintaining full planting depth. 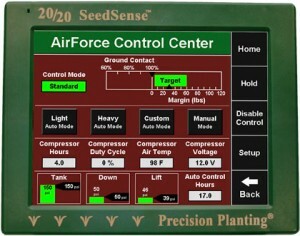 AirForce takes the information from SeedSense and uses air to automatically increase or decrease the weight on the row unit. The row units will now run as light as possible . . . with just enough weight to keep the row units proper depth. 20/20 AirForce® takes a costly problem that you had no way of managing and fixes it automatically. Taking signals from the 20/20 SeedSense®, the system increases or decreases air pressure in row-unit airbags to increase or decrease weight on the row unit. SeedSense sensors constantly report row unit weight and excess weight (margin) that could be removed. Then AirForce responds – automatically. Here’s the secret that allows AirForce to rapidly respond to changing ground conditions. The small lift bag can inflate and deflate quickly. It works against the traditional down force system (springs or airbags) to “dial in” the correct row-unit weight for each condition. AirForce includes an air reservoir, a high duty-cycle compressor plus airbags and mounting brackets to match your planter configuration. Simply bolt the airbag mounting brackets and pressure bags on your existing parallel arms. Light - gives you an extra light footprint for easily compactable soils or wet soils. Medium - is the primary setting for most conditions and will be the default setting. Heavy - is for areas where excessive clods, rocks or speed require some extra holding power. Manual Control - allows you to shift from automatic mode and change down force manually from the 20/20 SeedSense display.